This oblong-shaped winter squash can weigh 2-4 pounds and has a pale yellow exterior skin. The inner flesh of a spaghetti squash looks like spaghetti and is mild tasting, just like pasta. Many Paleo and low-carb eaters use spaghetti squash as a substitute for noodles; just top with a pasta sauce and voila! Easily prepare a spaghetti squash: cut the squash in half lengthwise down the middle, scoop out the seeds, then roast in the oven for 45-60 minutes. 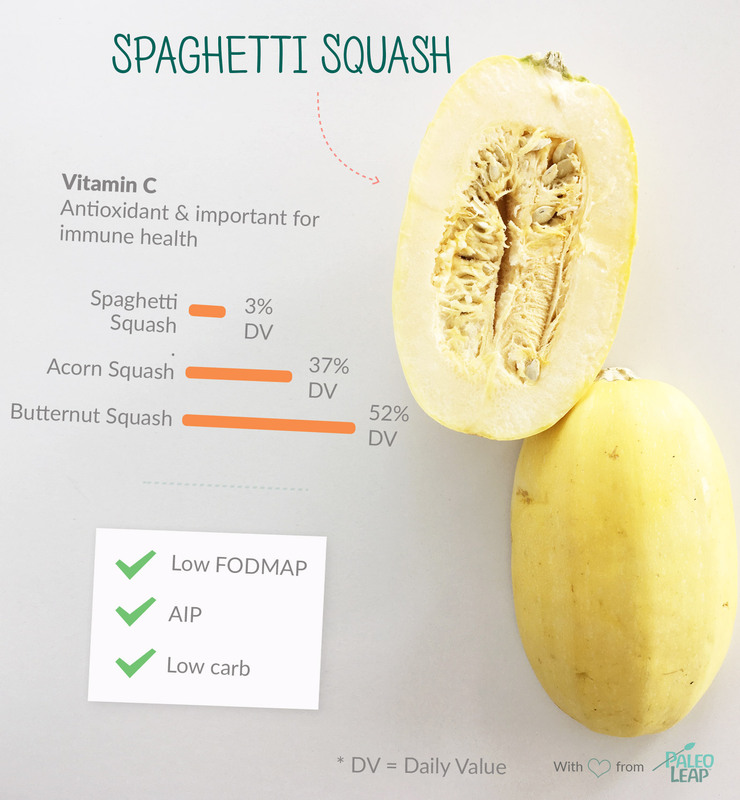 Orange dots show how 1 cup of spaghetti squash fits into the typical nutrient profile of a Paleo meal. PURCHASE: Be sure the spaghetti squash is firm, dry and blemish-free. Bruises and cracks will shorten the storage life. SEASON: Peak harvest for spaghetti squash is late summer through winter. STORAGE: Store spaghetti squash in a cool, dry area. They can be stored for many weeks, but check to be sure the skin is firm and blemish-free before cutting. Swap out pasta for spaghetti squash and bake a lasagna dish. Mix together spaghetti squash, spinach and seasonings, then fry up a batch of fritters. Halve a spaghetti squash lengthwise and bake an open-face, sausage-stuffed spaghetti boat. Combine spaghetti squash, seasonings and an egg in a muffin tin. Bake to create a convenient egg nest.